JayTheBanker's Blog: UP with KETCHUP! Yes, it is true.. I really, really enjoy my ketchup! And yes, I'm a bit over the top about it..
PIZZA, EGGS, TOAST, ANY SANDWICH (not on PB&J).. red just rocks on nearly everything!! Tonight I have proclaimed myself, "THE SAUCE MASTER"..
Today, for instance, as I consumed my chik fil a combo..(which was very nice).. I pulled a "15'er".. That's 15 of my favorite friends with the sandwich and fries.. that's 15 packets. 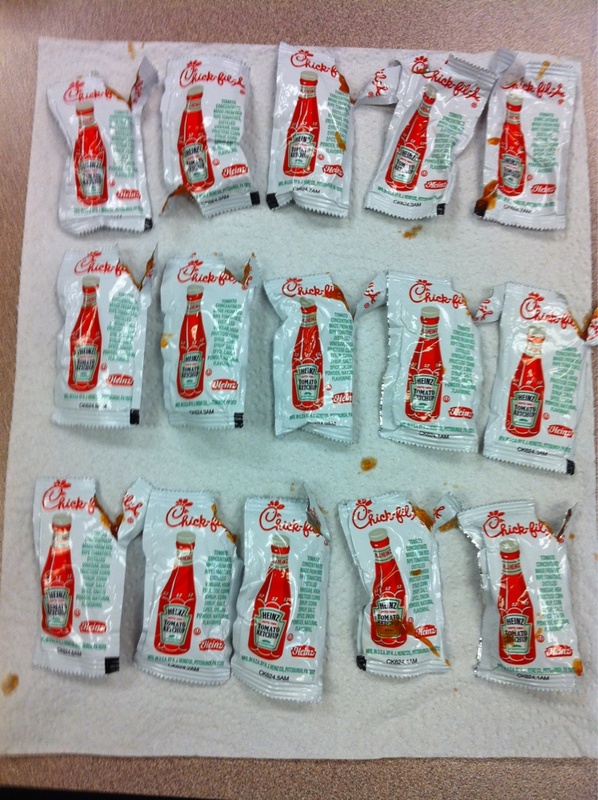 Here's a picture of my Warhol like ketchup packet art. My friend Eric will love it (he's an artist)! I'd call mine true minimalist art.. I wonder if eBay can handle an auction for "ketchup packet art"? ?